Like a lot of parents, I have a veggie problem. That is, my kids have a veggie problem. They refuse to eat them. It started the moment I introduced fruit to them as babies. They loved their pureed peas, carrots and broccoli, but the moment I introduced fruit to them, it was all over. And it’s been an uphill battle ever since. Every night at dinner, it’s the same thing, cheering them on, cajoling, begging, bribing. It’s enough to make me pull my hair out. Dinner should be a pleasant experience and I want to leave my kids with happy memories of dinner times together. 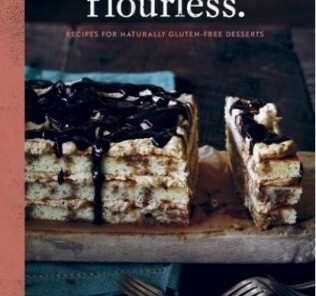 So that is why, when I came across this book titled Deceptively Delicious I thought that maybe this cookbook was the answer to my prayers. 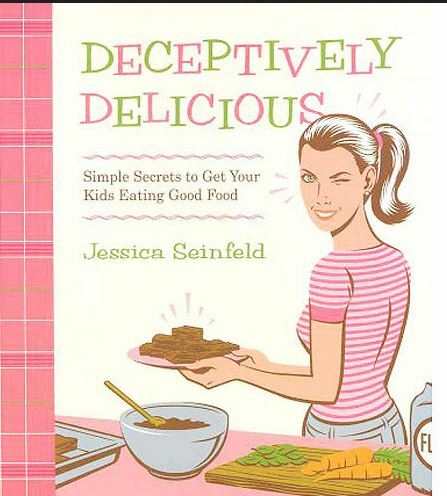 Written by Jessica Seinfeld, (the wife of comedian Jerry Seinfeld) Deceptively Delicious aims to sneak veggies into your child’s diet via homemade vegetable purees. The book starts in a practical manner by showing you how to cook, roast or steam the veggies needed in the recipes you will be making and how to package them securely in small freezer bags, so that they can be defrosted and used in the recipes that require them in a jiffy. I found this first, practical section of the book to be very helpful. The measurements and cooking/baking times were precise and the pictures included were very useful as well. 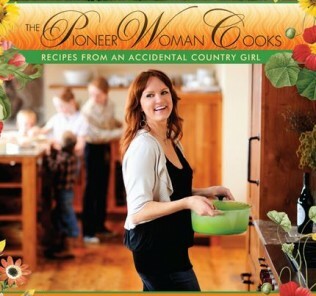 When I first flipped through the book, quickly glancing through the recipes, the first thought that came to me was that I was curious to see how in the world the author would hide veggies in recipes such as mac n cheese, buttered noodles and ice cream sandwiches. I’m pretty picky about my food ( maybe that’s where my kids get that from). 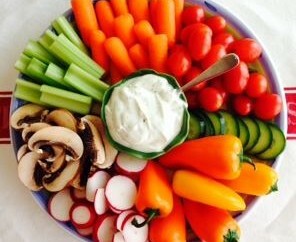 I really like to eat healthy food, but it’s got to taste good. 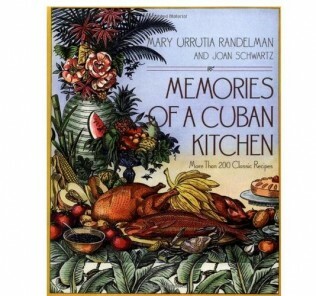 There are quite a few recipes in this book that I feel are exceptional enough to make again and again. Please remember that this is only my opinion. For breakfast, the pancakes were an absolute hit in my household. 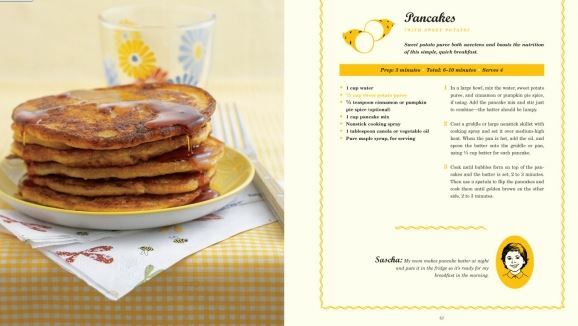 The addition of the sweet potato puree is a great enhancement to this breakfast classic, and my kids hardly noticed that there was anything different added to this pancake recipe. If anything, they thought I had changed it for the better, because the addition of the pancakes made them sweeter. 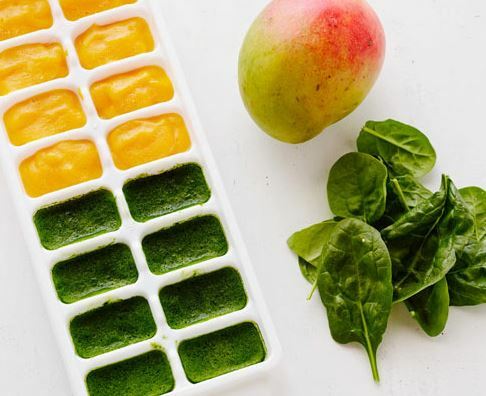 This is an easy way to add some Vitamin A to our diet without my kids so much as batting an eye. Another excellent recipe are the Blueberry Lemon Muffins. 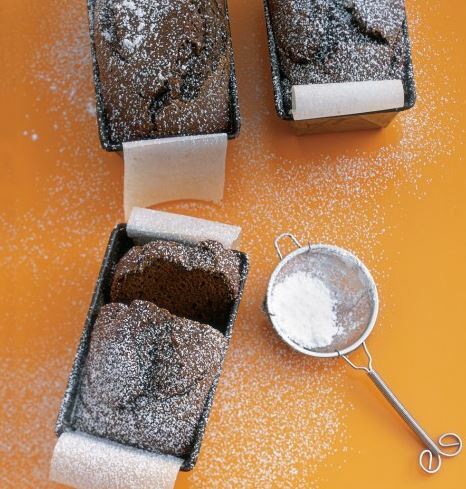 These are absolutely wonderful and probably one of the best muffin recipes that I have ever made. The addition of lemon yogurt, lemon extract and lemon zest masks the yellow squash puree that is added. I promise you won’t even taste it. 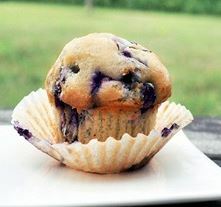 The muffins are moist and flavorful and the melding of the lemon flavor with the blueberries just burst in your mouth surprisingly and with a great deal of freshness. For lunch/dinner the Macaroni and Cheese I recipe is great. (There are 2 Mac n Cheese recipes , Part I and Part II). 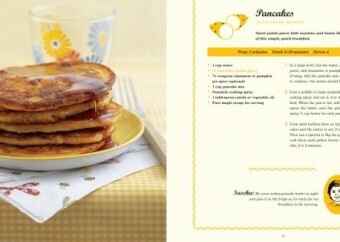 I really liked the flavors and again, the squash puree that is used does not overpower the recipe at all. Moving on to snacks, I think this next recipe is worth the entire cost of the book to me. 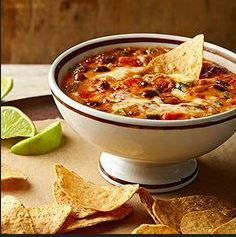 It is a salsa dip made with a red pepper puree, salsa, cream cheese and beans. This recipe is so good that I have to double and sometimes even triple the recipe, that’s how quickly it goes. This, is the crowning achievement of this book and is excellently done. Lastly, the hot chocolate sweetened with sweet potato and the fruit punch with the raspberry carrot and pineapple puree are lovely. This also is a crowd pleaser. I hate to say this sort of thing about a cookbook that has obviously had someone’s blood, sweat and tears poured into it, but some of the recipes are just not that great. The mashed potatoes with the cauliflower puree is one of these.. The flavor is bitter and not very kid friendly at all… the adults didn’t like it much either. The Gingerbread Spice Cake was a total disaster. It may have been that I did something wrong while preparing the recipe, but most likely , broccoli puree should just not be used in anything with the word “cake”. It was inedible. Last of all were the Brownies made with spinach and carrot purees. To be honest, I thought they were fine, I actually liked them, but no one else in my house did. I thought these recipes were great, I love how easy it was to hide tons of purees in my spaghetti sauce, ingenious! Again, I just don’t think that my family was as enthusiastic about them as I was. While it has been a while since I have prepared some of these recipes, I have been inspired to buckle down and again start adding in veggie purees to my food recipes. Many people who I have spoken to disagree vociferously with the basis of this book, which is sneaking veggies into your children’s diet. 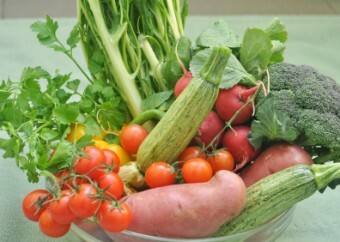 Many say that it is indeed “deceptive” and that it doesn’t teach your kids to learn to eat fresh veggies at every meal. I happen to think that every parent needs to follow their instincts for their child. Besides, why not do both? Why not serve a veggie with dinner and hide a veggie puree in the meal as well? If it bothers you so much to not tell your child what is in the recipe of the food that you are making, why not have them help you in the preparation of the meal? 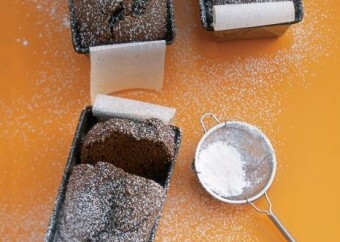 Children are much more likely to eat something that they have had a hand in preparing. 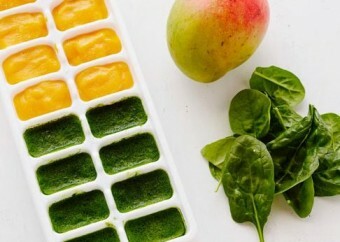 Looking at the freshness of some of these recipes, it is hard to dispute that the great amount of fruits and veggies in every recipe looks and sounds attractive and appealing. 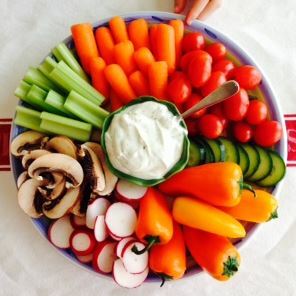 Bottom line, if your child is struggling with eating their veggies, this book will give you a great head start in helping to re-shape their taste buds and fill them up with the healthy nutrients their bodies desire and deserve.